Healthgenie single bed mosquito net ensures 100 percent protection against mosquitoes, flies and other insects. This easy to install net with one of the finest mesh ensures that nothing can enter through this mesh. 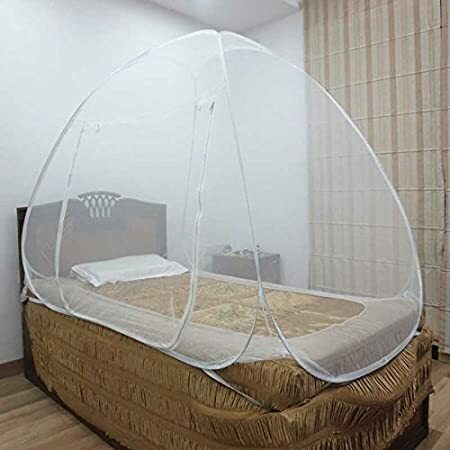 So it doesn't allow mosquitoes to enter through it and prevents you from deadly diseases like dengue, malaria caused by mosquitoes, insect bites. It comes with foldable facility and is very much light weighted which allows the users to carry it while travelling or using it at home easily. So now there is no need of finding bamboos and hooks to make a mosquito net on outings simply put this net in small bag. This light weighted easy to carry net can be installed anywhere any time. The net creates a comfort zone for sleeping and ensures a sound sleep for babies. The spacious net have large zipper gates which allows easy entry and exits. Net comes in many different colours to choose from which gives buyers a choice to purchase their favourite colour so that it could enhance their décor as well.